Measurements: 2.75 x 4.7 inches; or 70 x 120 millimeters. Fully gilt-edged. Back of card: Purple/lavender with circle. Inside circle, Greek equal arm cross with IC/XC/NI/KA in the corners, symbolizing Christ the Conqueror. Can be inverted if you don't look too closely. Booklet included: Yes, small, 123 pages, 2.6 x 4.65 inches, or 66 x 118 mm. Text by Rev. Ralph M. Moore & various others. Publisher: Gamemasters Inc, Port Chester, NY. Printed in Switzerland by AGMuller. Comments: The best packaging we've yet seen for any tarot deck: Sturdy black plastic box with metal hinges, black felt interior, black ribbon to pull the cards out. Note also the gilding (eg, gold edges). Gilding greatly extends the life of the cards. The cards themselves are sweet, frankly. We liked them. There are no major arkana cards, there are only four suits of 13 cards each, plus two non-identical jokers. Each Evangelist gets a suit (Matthew, Mark, Luke & John). We've shown two cards from each, above. Luke, the first suit, starts with the birth of Christ. Matthew continues the story with Jesus's earthly mission & miracles. Mark tells the story of Holy Week & the Crucifixion. John shows us the Risen Christ. So far, so good. The booklet, which is substantial, is full of the usual hackneyed nonsense. 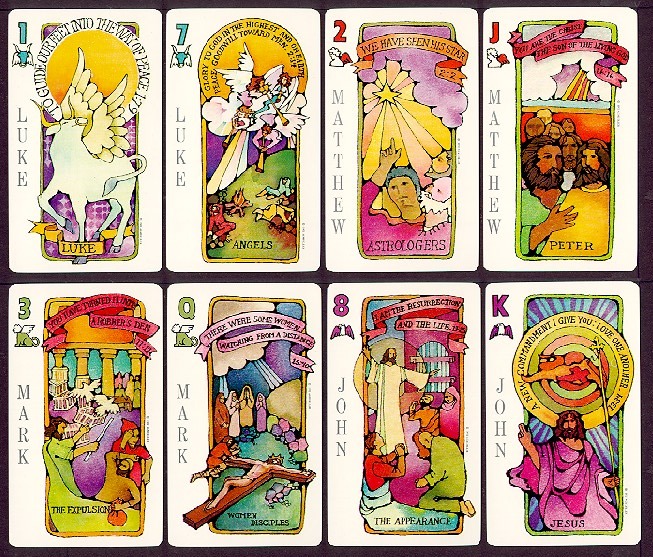 As we've mentioned on many other tarot pages, Jesus was a magician, or magus. The religion he founded was and is primarily magical in nature. The Mass, even in the sad form the Catholics practice, is intensely magical. This magic, the Mass, is deeply nourishing to the human soul, which is the only reason the Church has survived severe mismanagement all these centuries and the reason it will survive many centuries more (though we hope the management improves!). Yet with magic staring them in the face, the very heart of Christ's work is shoved aside and a bankrupt preaching is put in its place. Here are some of the card games you can play with this deck (from the booklet): Inspirational Solitaire, similar to regular solitaire. Game of Gospel Bridge, similar to whist. Game of Peace, similar to game of war. Game of Hearts of Marks, similar to hearts. Game of I Believe, similar to I doubt it. Game of Witness, similar to gin rummy. Game of Four Books presumably an entirely original pile/discard game (like so many others). Game of Go Seek, similar to go fish. And, lastly, the Game of Spiritual Concentration, where all 52 cards are laid face down. Object is to find matching pairs, like the old TV show, Concentration. Isn't this stuff wonderfully original!